Taylor Fuel Control offers a range of Steel Fuel Storage Tanks designed, manufactured and if required installed. They have been installed in some of the following; Truck and Bus Fleet Depots, Taxi firms, Farms, Marinas, General Plant Room Areas. 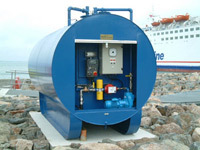 Tanks can also be fabricated in Stainless Steel for particularly aggressive environmental locations. Our standard range of fuel tanks ?The Enviro-Fuel-Store? 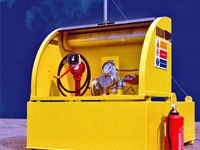 are rectangular and cover sizes from 5,000 litres to 100,000 litres. Each standard Enviro-Fuel-Store is of double skin construction and Manufactured to BS 799 Part 5 requirements. The interstitial space between the inner Main Tank and the outer Secondary Tank functions as a fuel spillage safety containment zone.